Vasant Panchami (Basant Panchami) is a festival celebrated with huge euphoria in India, especially in the northern regions. It is a festival that heralds the beginning of Vasant Ritu (Spring Season). Vasant Panchami is celebrated on the fifth day of Shukla Paksha of the Magh month of the Hindu Calendar. In 2017, it will be celebrated on 1st of February. The festival is also celebrated as Shree Panchami or Saraswati Puja in West Bengal and few parts of Orissa. The most recommended Muhurat for the Pooja is between 07:09:40 am and 12:34:55 pm. The duration of the Pooja lasts for almost 5 hours and 25 minutes. So, this time is considered to be very auspicious for marriage in particular and the Saraswati Pooja is considered to be good for Griha Pravesh. The day of Vasant Panchami is staunched to Maa Saraswati, the Goddess of knowledge, arts, music, science and technology. On this very day, Vishnu, Radha Krishna and Saraswati are worshipped with yellow, pink and white flowers. Apart from these, water offerings, lamp, incense, Naivedyam (rice prepared with jaggery) and also yellow colored halwa is presented to the almighty. Vasant Panchami is also known as the festival of Harvest, as it signifies the blooming flowers of mustard and hence yellow color upholds utmost significance in the celebration of Vasant Panchami. The devotees of Goddess Saraswati adorn the idol of Goddess with yellow sari and also the devotees wear yellow attires on this day. Also, it is considered as a propitious occasion for the students to start their studies, marking a new beginning of their learning period. Schools and colleges organise special prayers to worship the goddess of wisdom. Usually the students place their books at the feet of Goddess and seek her blessing for better learning & understanding. Wake up early in the morning. Take a proper bath and wear yellow coloured clothes after that. The Pooja place should be cleaned and you need to face the North or North-East direction while praying. A white cloth should be placed at the Pooja place and rice & pulse should be spread on it. Then Astadala Padma( eight petal lotus) is made with rice and the idol/photo of Saraswati Maa should be placed there. Then flowers are to be offered followed by vermillion and then incense sticks should be burned. People who look forward to the spiritual enhancement can wake up early at 4 because the time from 4-6 is considered to be a Brahma Muhurat which is an auspicious time for gaining spiritual superiority. It is considered as a propitious occasion for the students to start their studies, marking a new beginning of their learning period. The Saraswati Pooja is highly beneficial for writers, creative thinkers and vocal performers, especially for the singers. Saraswati is the Goddess of learning who endows humanity with the greatest wealth i.e. knowledge. On the occasion of Vasant Panchami children are taught to write for the first time by their mother, guru or a learned person using a chalk (khadiya) so that the child excels and gains the best education and knowledge in the life ahead. Then after the worship of Goddess Saraswati, the students keep their educational books underneath the idol of Goddess Saraswati. Apart from this, Brahmins are fed and are given pulses (daal). The image of Goddess Saraswati sitting on White Swan symbolizes the Supreme Power. The white swan of Goddess Saraswati denotes Sattwa Guna (purity and discrimination), the lotus of Lakshmi the Rajas Guna and the tiger of Durga the Tamas Guna. Goddess Saraswati is depicted possessing four hands and plays “Veena”, an Indian string musical instrument. Goddess Saraswati, the goddess of knowledge and arts, represents the unconfined flow of wisdom and consciousness. She is the mother of the Vedas, and chants to her, called the ‘Saraswati Vandana’ often begin and end Vedic lessons. The erudite and the culture attaches greater significance to the worship of goddess Saraswati. According to many Hindu astrologers, the day of Vasant Panchami is considered as the Abujha day which is contemplated as an auspicious day to start a good work. People also dress up in yellow clothes and offer yellow flowers to deities in the temples. The four hands of the Saraswati denotes the different sides of human personality in learning. Goddess Saraswati seated on a white lotus and is dressed in a pure white sari. When she is seated on a peacock, she signifies that wisdom vanquishes ego. According to purana, Lord Brahma after creating the universe was very disappointed to see the silence present everywhere. 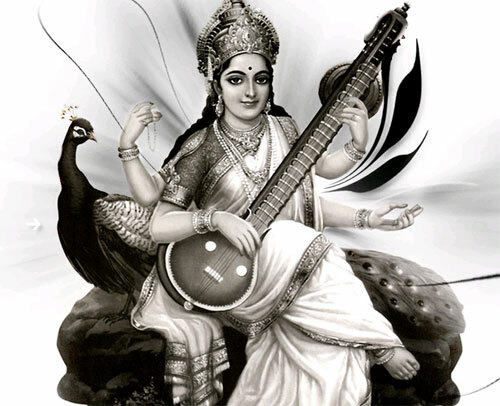 Then goddess Saraswati gave sound to his creation through her Veena. Vasant Panchami is celebrated with great bliss among the people of India (northern parts of India), as it is famous as a kite flying festival as well, especially in Punjab and Haryana. Also in many parts of the country, people arrange a grand canopy to welcome the Goddess and worship her. In West Bengal, the devotees carry out various processions in which idols and sculptures of Maa Saraswati are carried to get it immersed in the holy river Ganga.